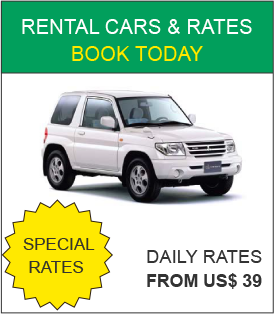 Competitive rates, easy and reliable car rental in Dominica. Valley Car Rental Dominica is a leading car rental company on the island. We offer competitive rates and provide a friendly and reliable service. This is why our customers always return to us! At Valley Car Rental we aim to ensure that you have safe, comfortable and reliable transport during your visit to Dominica. Our car rental fleet offers a variety of quality 4×4 jeeps, SUVs and buses, to suit your every need and budget. All of our car rental vehicles are well-serviced and are equipped with air-conditioning and power steering. 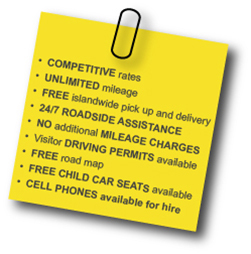 Car Rental Offices are located at Melville Hall Airport, Roseau and Portsmouth. From our offices, we provide free pick up and drop off services. 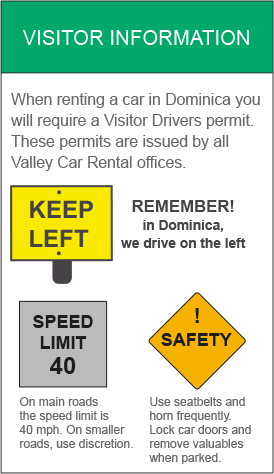 When renting a car in Dominica you will require a Visitor Drivers permit. These permits are issued by all Valley Car Rental offices. Cell phones are also available to hire during your stay in Dominica. Get the best rates for car rental Contact Valley Car Rental Dominica Today!